Give Your Knees The Proper Support With Our 360 Compression Knee Brace. Our 360 Compression Knee Brace helps elevate your everyday fitness & well-being, it eliminates and prevents knee pain with its revolutionary 3D weaving fabric to ensure that the knee is properly supported and aligned, thus reducing pain significantly. This protection is especially important for knees put under great daily pressure (running, jumping, weightlifting, etc). It also ensures blood is flowing properly through the knee, which is extremely important during and after any activity. Compression + blood flow = better recovery. Not only will your injury heal faster with less pain, but you will also prevent further injury when wearing this sleeve regularly. Studies and reports have shown that your knees, at times, bear 5 times your body weight. Our 360 Compression Knee Brace supports and alleviates the pressure put on your knees. Protecting joints is crucial for avoiding long terms health issues like arthritis, bursitis or even dislocations. High-Quality Fabric: 68% Nylon Fabric and 32% Spandex. Comfort: Lightweight, Breathable & Adjustable comfort fit with quadruple elastic stretch that won't roll, slide or slip. No skin irritation or itchiness. 3D Tech: High quality, anti-slip double stitching texture technology provides superior mobility, comfort & durability. Allows for hours of continuous use. 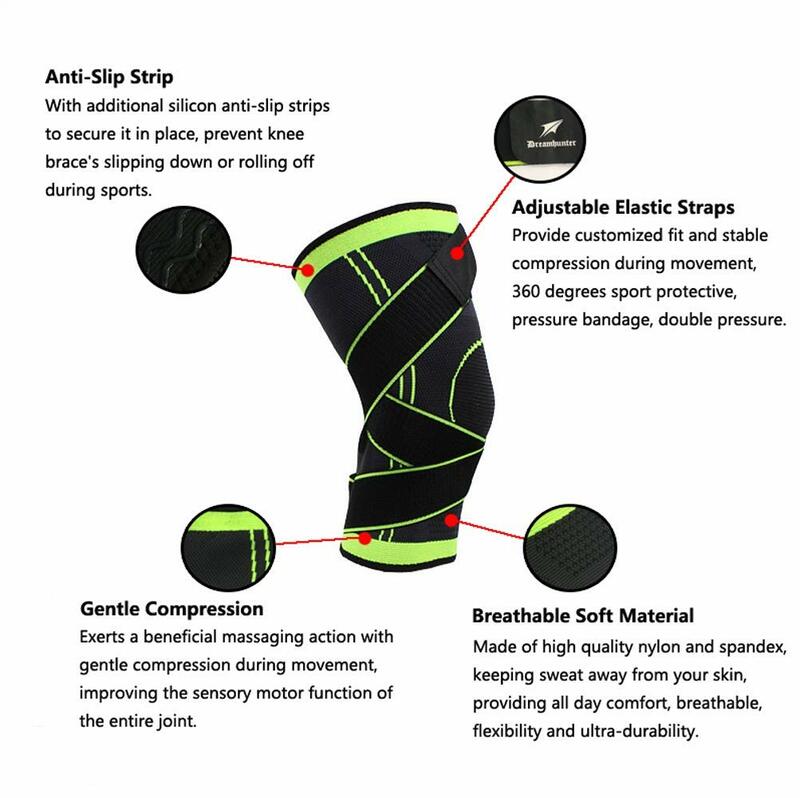 Design: Two adjustable, high-performance bi-directional compression straps allow for 360-degree protection for knees or patellas. Protection: This brace retains warmth and provides comfort, superior flexibility & durability for daily wear. Performance: Enhance Oxygenation of blood to increase muscle performance & accelerate recovery of injured muscles, joints, etc. S-Top width 15.5cm, down width 13.5cm, length 26cm. M-Top width 16cm, down width 14cm, length 26cm. L-Top width 17.5cm, down width 15.5cm, length 27cm. XL-Top width 18.5cm, down width 16.5cm, length 27cm. XXL-Top width 19.5cm, down width 17.5cm, length 28cm.